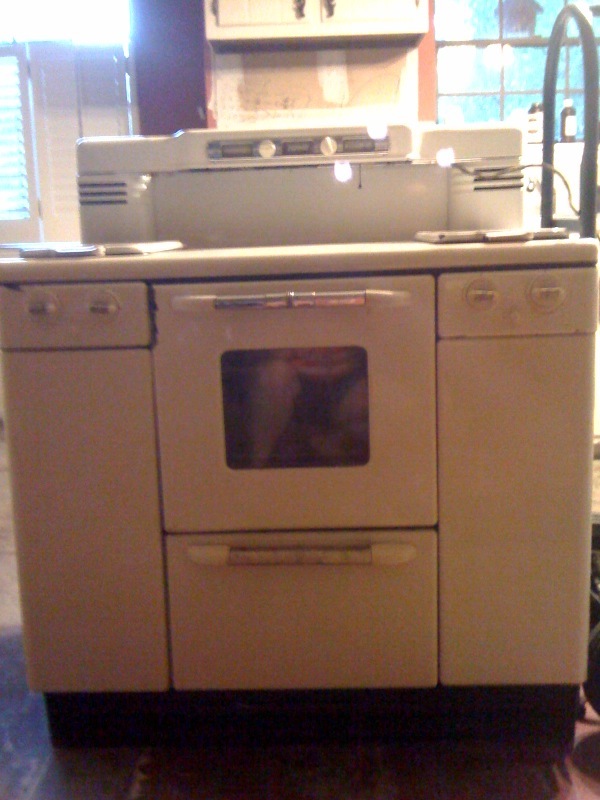 Anne sent me a photo of her model WX15-2-B2429 Tappan stove. She says that it works great but the clock and glass covers over that and the timer have broken. It has the oven on one side and a broiler on the other. It was purchased about 20 years ago in San Luis Obispo CA and is not original her house. She has no idea of the age and said she has never seen another one like it. When purchased, it was very dirty but otherwise pretty much as can be seen in the pictures. The only restoration it needed was a little cosmetic touch. 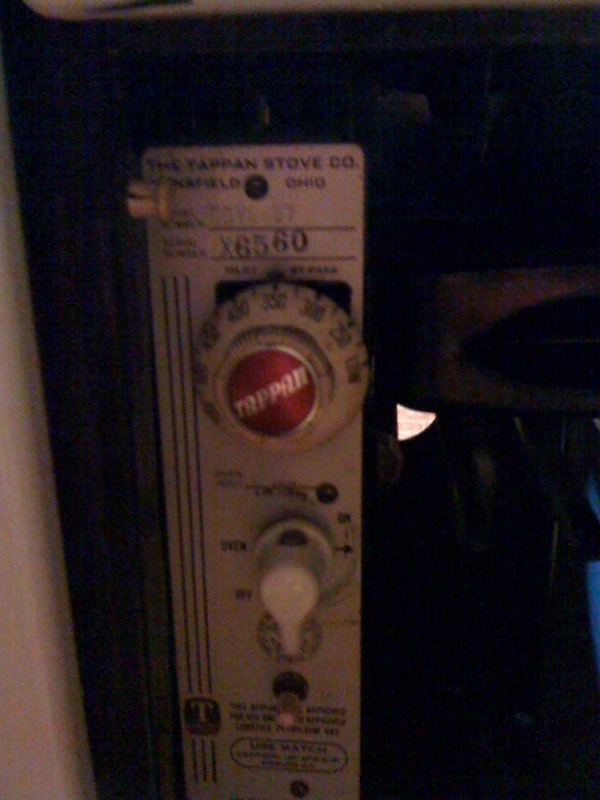 The little pieces around the timer and clock were re-chromed, as was the tiny "Tappan" plate. 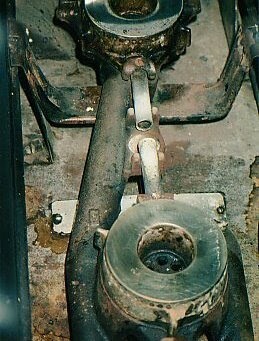 They had been cleaned too many times that the metal was worn off and discolored. The oven temperature knob says "Robert Shaw". Anne says "It's a very practical stove with some features I really like. Being able to cover the burners is a nice touch. The space between the burners is so handy too, especially for canning. Big pots are no problem. 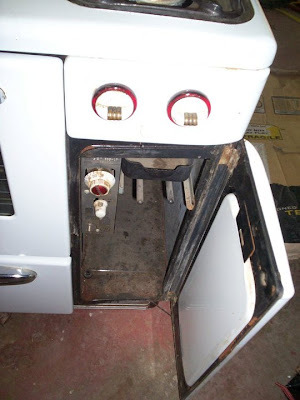 You can also remove the lower trays to clean- no more ugly spills. The back light doubles as a nite lite." I have a little surprise for Anne if you scroll down to the last picture. This comes from a 1940 Sales Manual....which I believe would put Anne's stove in the late 1930's. Thanks for the email and photos Anne! Yesterday I posted photos of an early 1940's stove sent to me by Dionne. 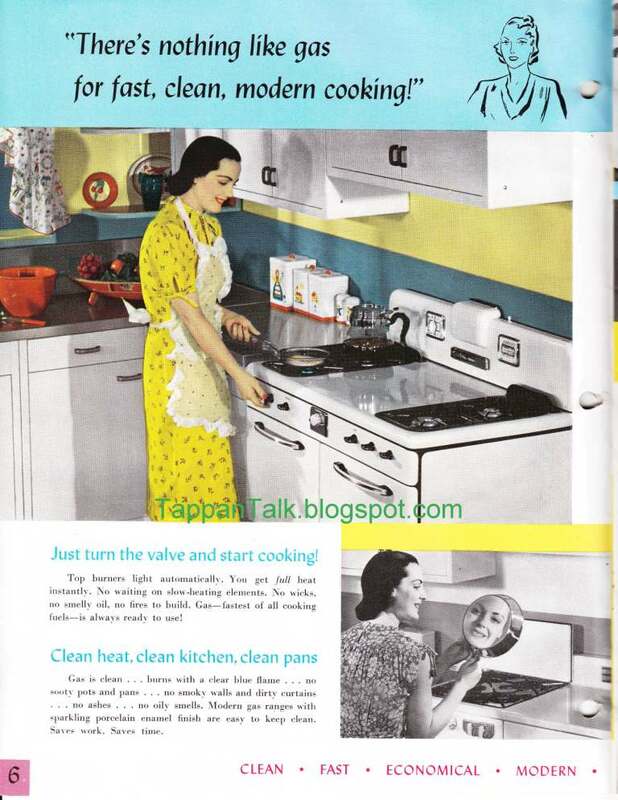 As it turns out, Dionne has two Tappan stoves. 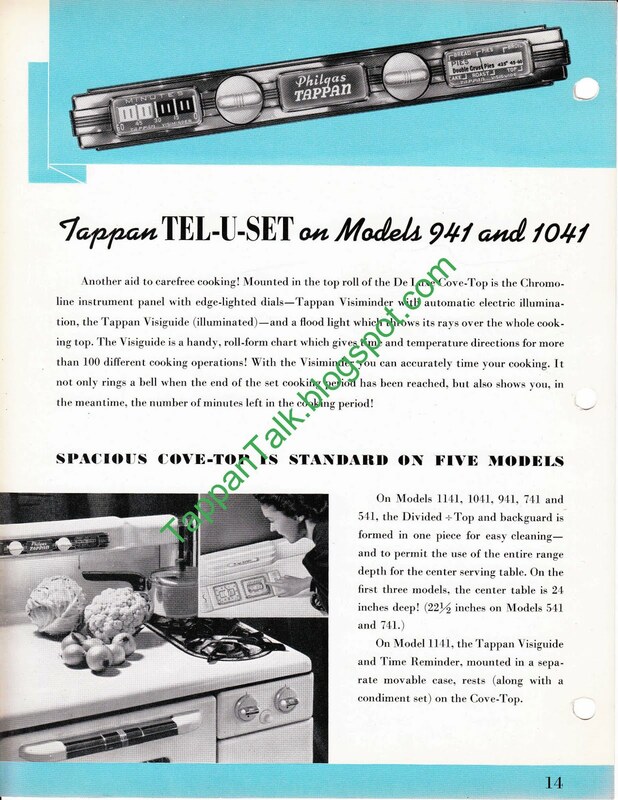 Here is the email Dionne sent to me with the photo of his Tappan Deluxe. One thing that caught my eye it that the previous owner said the stove was purchase in 1958. 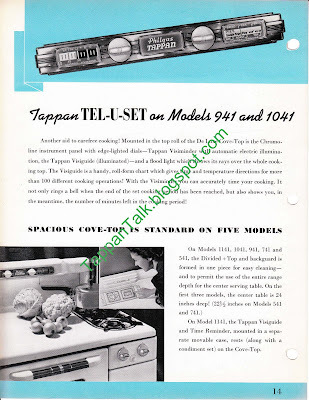 The model number on the Tappan Deluxe is TV62-28 with a (perfectly working) Robert shaw thermostat. If you look at the burner grates, they match those of the later PHADV stoves we have seen from other readers (burner grates). 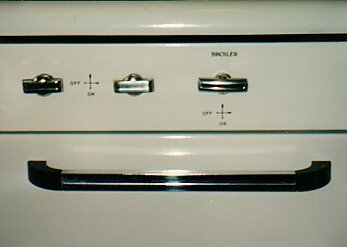 The burner knobs are either replacements or a newer version for the later Deluxe stoves. This stove has a Telechron clock. 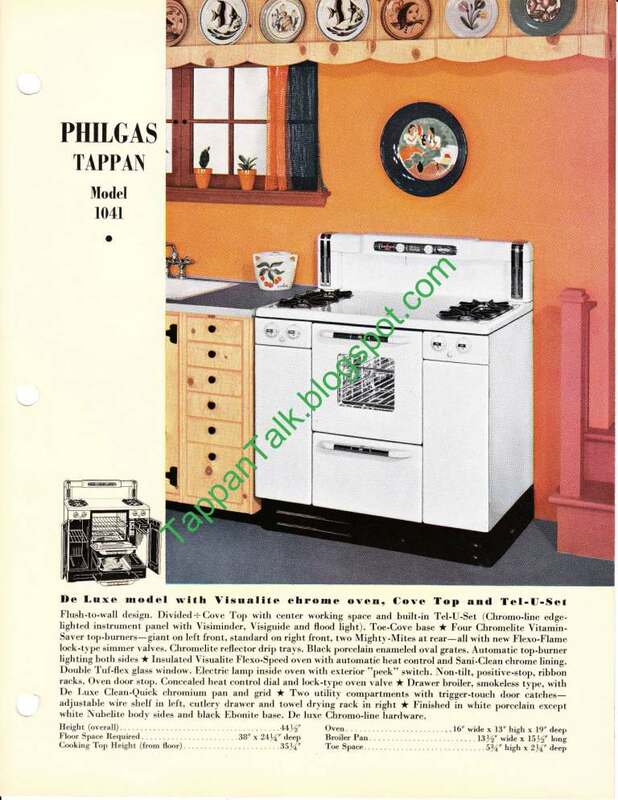 It would be fun to see a Tappan stove in a custom color. The Chambers stove owners currently have a corner on the colored vintage stove market. I also obtained a Tappan Deluxe range so now I have the 2 stoves. 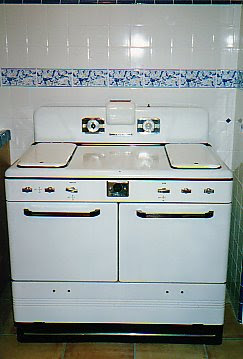 The Deluxe came from a house in New Orleans where the owner stated that his parents bought the stove in 1958. It is in great condition and I can't believe how clean it is for it's age. I brought the burners, burner valves, and the clock to a place about 30 miles from me that restores antique stoves. I also bought replacement knobs from them. The place is called "Hugh's", and they have a website. 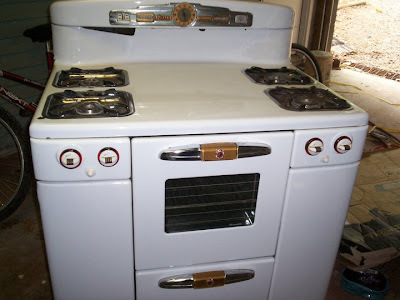 I am thinking of restoring the older one also and put it in my outdoor kitchen. 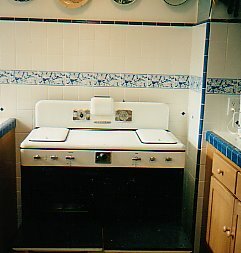 I would like to know if you have ever had experience with having an old stove reporcelained by those people who refinish bathtubs. I spoke with someone who gave me a quote of $250.00 and guaranteed the finish for 5 years. I am thinking of doin that to the older one, and changing the color from white to apple green or poppy red. Maybe even thinking of purple and gold LSU colors since this is an LSU crazy town. That would be the one for the outdoor kitchen. I just think that I need to really coat the finish inside and out with something durable if it is going to be exposed to heavy humidity. 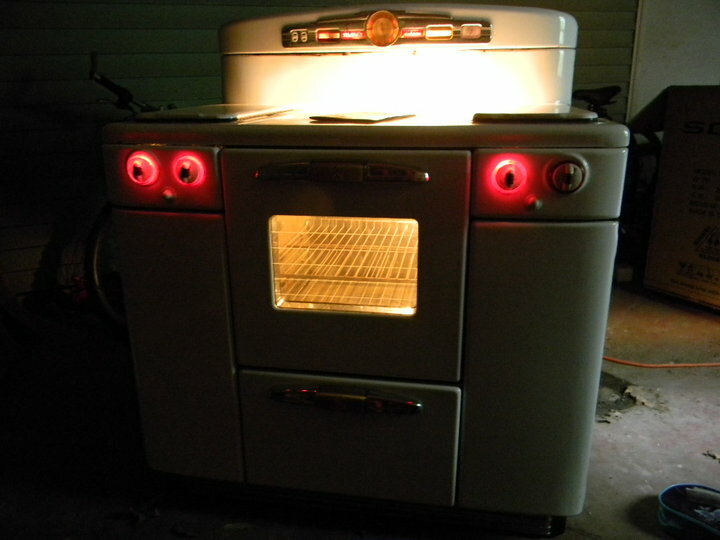 Dionne sent me photos of his early Tappan stove model #BGVD-57 with the following info: The inside of the oven is chrome. No clock, just a visiminder and a guage for cooking times/temps of various foods. It has a pull string light. 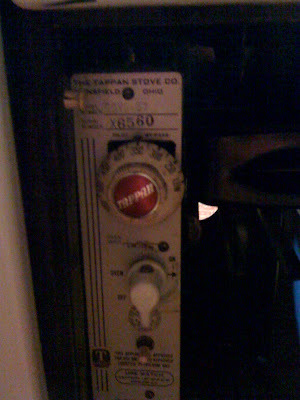 It does not say "deluxe", just says "Tappan" on the stove backsplash and on the red oven temp knob in the control box. 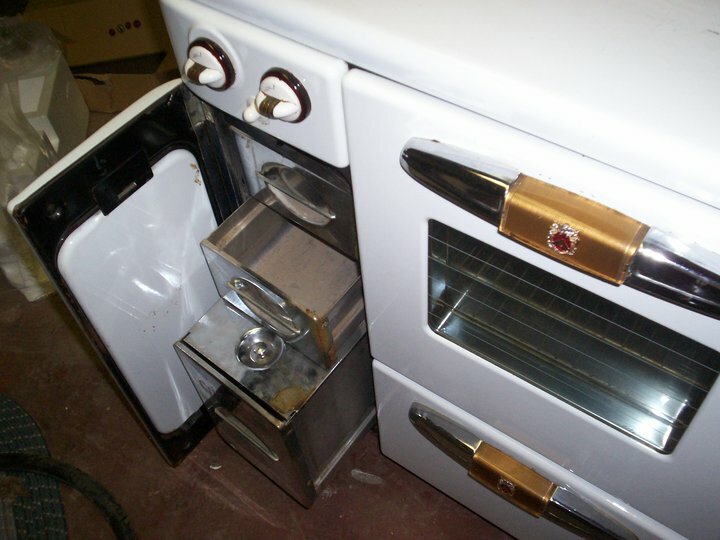 It has a pull out drawer and towel rack on on side with the controls and the other side compartment has a pull out wire basket and drawer. 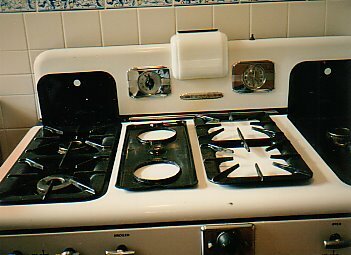 The burners on the stove have one continuous grate over 2 on each side. The first thing I did was pull out some old Sales Manuals. 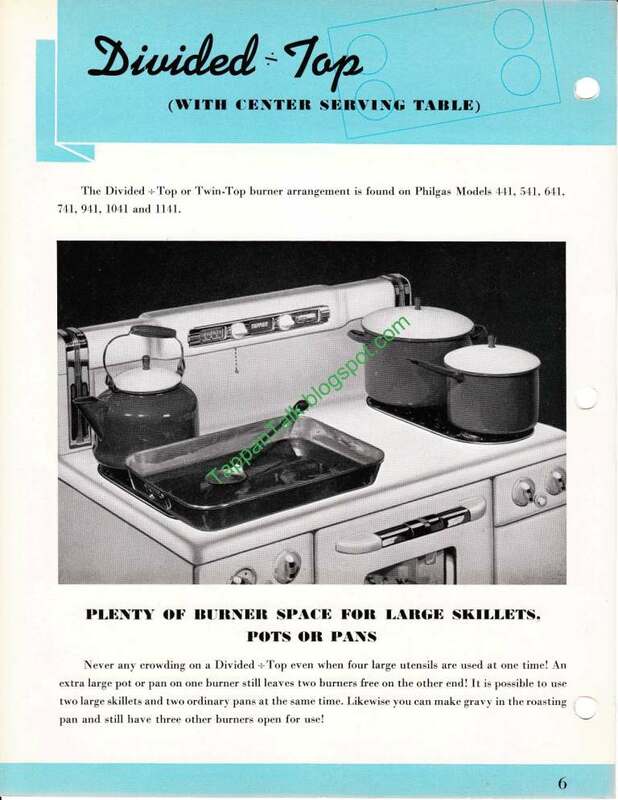 I do have some pictures of a stove similar to this one in a 1941 sales manual (the 1940 sales manual I have does not have anything similar). 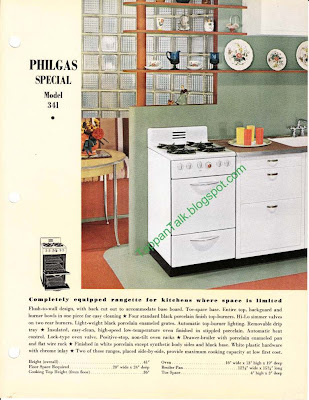 The stove in my 1941 manual has the same back splash as Dionne's....(which was called the "Deluxe Cove-Top" with "edge-lighted dials"). It looks like this was a newer back splash that they were introducing. 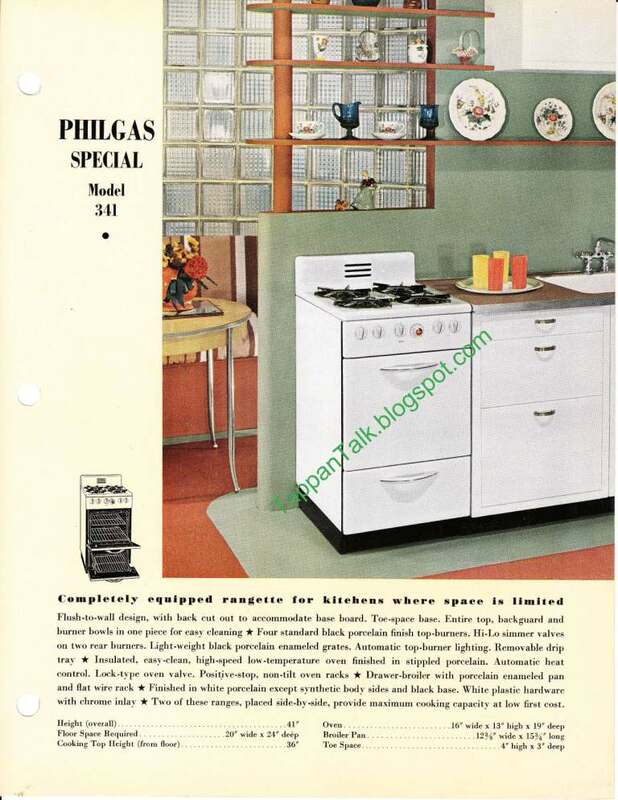 The stove in this manual was different from Dionne's in that the vents on the back splash do not run horizontally. It's a little hard to tell from the pics, but I think the vents in the sales manual are either vertical..or the stove vents from the back. The knobs on the manual stove are an older style...Dionne's are the same as the later Deluxe. The burners on the sales manual stove are also one unit on each side. 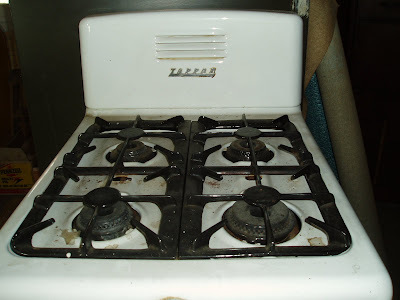 I'm guessing this stove is a 1942 or 1943 model. Your guess? A reader emailed these photos to me. 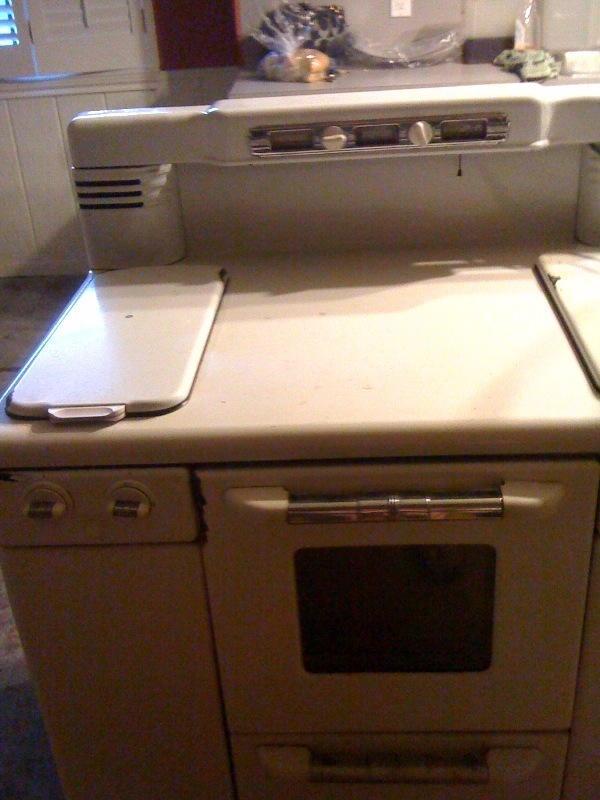 This 20" gas stove was part of an estate sale and they wondered if I had any information on it. I thought it was adorable. The stove has pyrogrates. The burner knobs look to be a newer style. Any guesses on age? 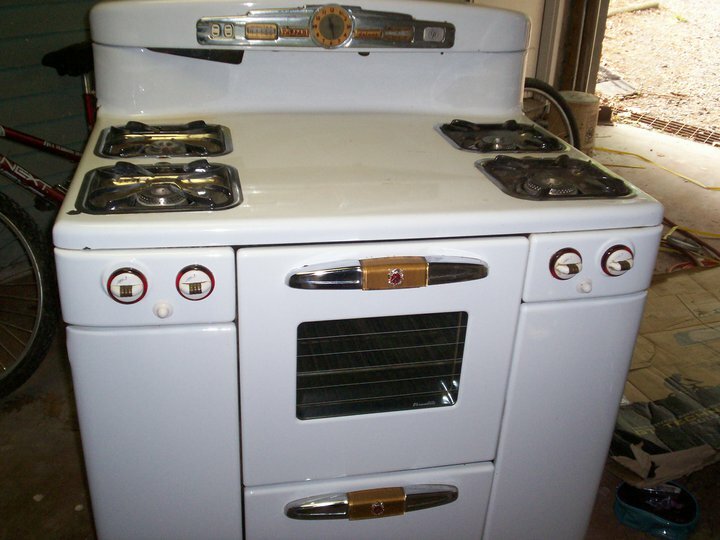 I enjoy getting emails from people telling either about their stove's history or how they found & bought their stove. Here's an email I received from Granny Sue. In 1976 I bought a Tappan stove (although not a deluxe model) and I loved that stove. Then we moved and were on LP gas. The price got so high for gas that an electric stove was a better deal so we got rid of the Tappan--not knowing what a treasure we had. 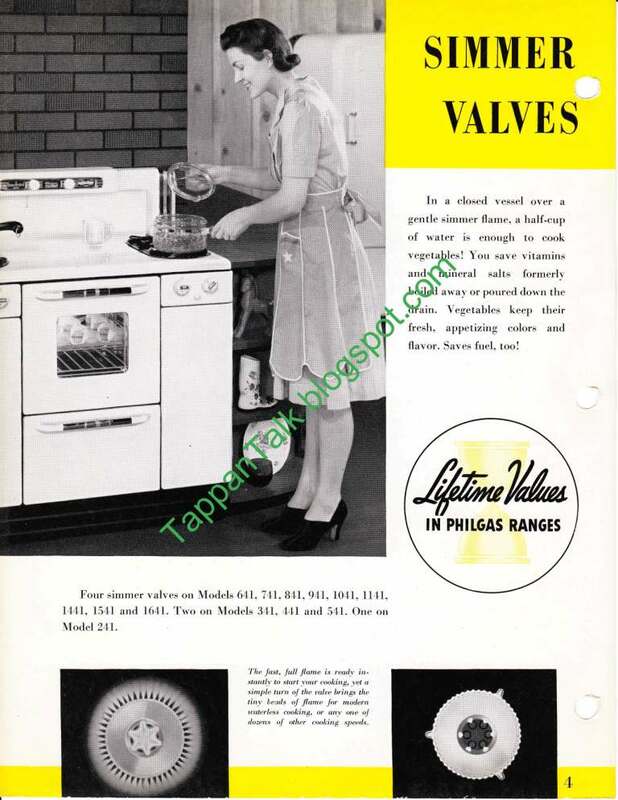 Since we would have gas again, I started looking for another Tappan, preferably a Tappan Deluxe. My son located one on a porch not far from where he lives with a for sale sign--$50. He checked it out, called me, and bought the stove on the spot. He has it at his house now and has plugged it in to see the if the lights work. All but one red burner light came on; we'll have to check into that. 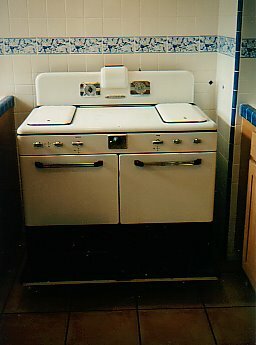 This stove belonged to the same lady from the time it was new. 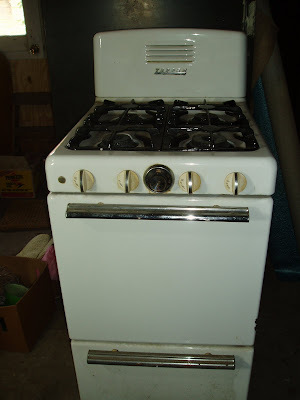 She passed away and the granddaughter who now lives in her house wanted a new stove. 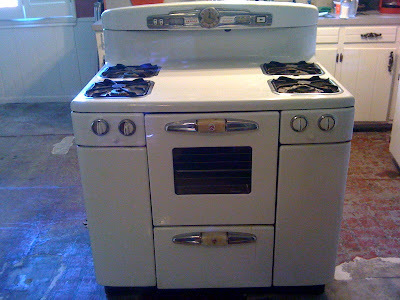 The stove has all its parts--burner covers, knobs, drawers, etc and is in just beautiful condition. 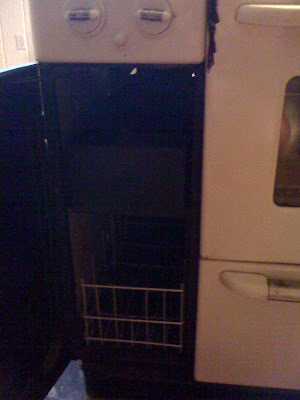 I do not know if the oven works properly, and after reading about the themostat issues people have had I'm a little worried about that, but the stove did work fine right up until it was put on the porch about 2 months ago.